Breakfast as the name suggests breaks your overnight fast, it provides your body and brain with fuel. And since it is the first meal of the day, it is the most important meal and has to be absolutely nourishing. When it comes to hypertensives, they have to be very observant about their breakfast choices. Along with choosing low sodium foods they also have to keep a check on the amount of salt going into the recipes. During a busy morning, it is easy to let breakfast fall low in your priority list, but taking just a few minutes to have something to eat can really make a difference to your day. · Breakfast should be eaten within two hours of waking. Apart from providing us with energy, breakfast foods also are good sources of important nutrients such as calcium, iron and B vitamins as well as protein and fiber. If missed during the breakfast, these nutrients cannot be compensated later in the day. The foods you eat may lower blood pressure as much as medications can do, therefore your food choice plays a very important role in maintaining and regulating blood pressure. It is recommended to start your day with a breakfast packed with key nutrients known to help with lowering blood pressure. One essential nutrient is potassium, as it counteracts sodium. Fill your breakfast with a lot of whole grains and several phytochemicals which can help to fight off high blood pressure. Calcium, Vitamin D and Magnesium are also important nutrients. Calcium and Vitamin D together work to lower blood pressure, and magnesium helps in regulating it. Here we bring to you the range of recipe options for hypertensives like Jowar Pyaaz ki Roti, Cabbage and Dal Paratha, Black Bean Hummus, Strawberry Oats Pudding, Poha Nachni Handvo. Having juices in the morning for those wanting to control blood pressure is not that simple as there are lots of fruits and vegetables which are naturally high in sodium. 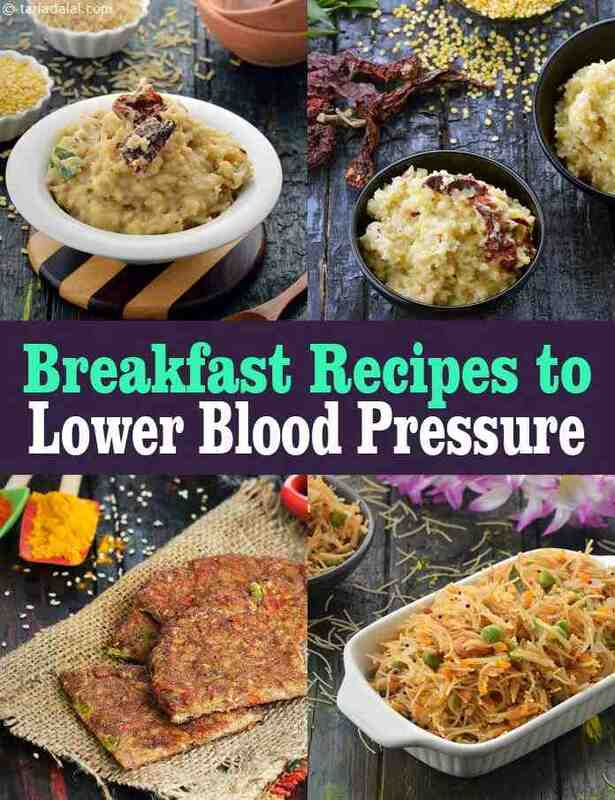 These recipes are perfect for hypertensives to keep their blood pressure under check and prevent it from aggravating it further.